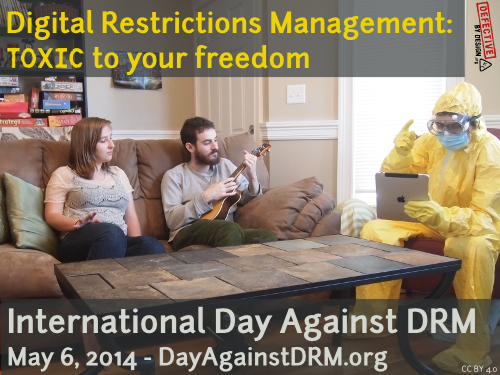 On Tuesday, May 6th, 2014, the world comes together to say no to Digital Restrictions Management. If you're arriving soon after the day, it's not too late! Please don't miss the opportunity to act now while the Internet is still buzzing about the International Day Against DRM. See how you can get involved, check out participating organizations, and read publications about the Day. During the last year, we've seen Digital Restrictions Management creep farther into the world of technology (including coffee makers and cars), even as we build a stronger and stronger community to fight it. A growing number of people are living within a box constrained by DRM without even knowing it. The future is DRM in everything, if we don't do something.